Posted by Jellio on August 03, 2007. - Can't make it to Chicago today for Lollapalooza? Well at least you can watch the webcast. - Classic clip of Richard Pryor as the Star Wars bartender, with all of the old bar regulars. - A follow-up to the classic Tea Partay video, JWT brings us the west coast effort...not good. - 15 unfortunately placed ads. Some really great shots. My favorite has to be Jesus kitty. 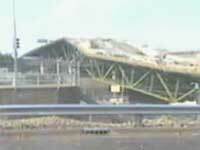 - And if you haven't see the footage of the Minnesota bridge actually collapsing, click here.